Why do conservationists need a field guide to economics on their shelves alongside the well-loved bird and plant guides? Two reasons, really. First, the economic decisions people make every day are at the core of the world’s conservation issues: climate change, Amazonian deforestation, tiger poaching, vulture declines in Asia, and countless others. Second, and more importantly, an understanding of the economic forces behind these decisions can help conservationists safeguard biodiversity in a more sophisticated and effective way. The authors use simple illustrations, examples from around the world, and readable (occasionally irreverent) prose to describe the central economic principles that are relevant to conservation. They assume no previous economic training. 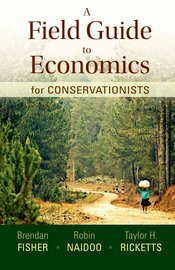 The book should prove an excellent resource for both teachers and students in conservation and ecology classes at the undergraduate and graduate levels, as well as for working scientists and others interested in learning more about conservation and economics.